Every person has a unique, sensational story in his/her life which is just waiting to be told and his / her dedication, passionate living transforms that story into a mind-blowing , grand novel. Novels : Not a Penny More, Not a Penny Less . Shall We Tell the President?, First Among Equals, A Matter of Honour , As the Crow Flies, Honour Among Thieves, The Fourth Estate, The Eleventh Commandment, Sons of Fortune, False Impression, A Prisoner of Birth, Paths of Glory. Prison diaries : Hell- Belmarsh , Purgatory - Wayland , Heaven - North Sea Camp . And still counting ... I mean writing... The literary Gems ... Kohinoors by Legendary #madeofgreat Sir Jeffrey Archer. MARCH 7 , 2011 .... I was checking emails and suddenly I caught the glimpse of an email by e-Bay. You are the winner of the 'Jeffrey Archer contest' organised by e-Bay on Facebook. Please email us your contact details so that we can courier you the prize . March 8, 2011 ( 8 a.m. ) ... I was almost ready to step out for a 'Women's day conference' and my mobile buzzed. It was Bhavana from e-Bay. "Good Morning Sujata, Congratulations. I have received your contact details. Will you be able to reach Trident (Oberoi ) within an hour ?. We have a surprise for you." " I know, it's such a short notice as we were trying to connect with his PRO. The surprise is 'The Jeffrey Archer'. If you can make it to Trident within an hour, you can personally interact with Mr. Jeffrey Archer. Would you like to come ?. "Hey Sujata, are you there ? Can you hear me ? Will you at least give it a try ? " - Bhavana was almost screaming frantically at the other end.
" Yes, Yes, YESSSSSS Bhavana. I am coming, Right Now, Right There"- I. How can I go empty-handed to meet my Idol, My Motivator , My Guru Dronacahrya , from whom I learned like Eklavvya. My father had this gorgeous coffee-table book full of enchanting, alluring Aerial photographs by Shri Uddhav Thackeray " Forts of Maharashtra ". 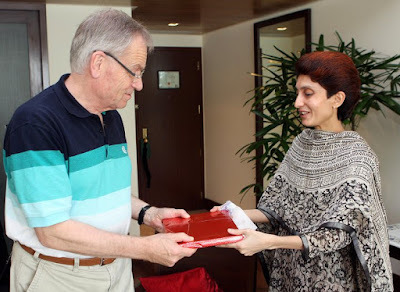 This book is my father's prized possession but when I requested saying " I wish to gift this to the one and only living Legend Sir Jeffrey Archer " , My father wrapped the book aesthetically and offered it to be gifted to Sir Jeffrey Archer. Ms. Deepa Thomas and the photographer of e-Bay welcomed me warmly at The Trident ( previously known as Oberoi ), she requested me to have a cup of coffee before we proceeded to Sir Jeffrey Archer's suite. I denied saying, "Let's hurry up, or we will lose appointment-time that's assigned to us". Deepa calmed me down saying " Right now, Sir is busy with TOI-journalist, so let's have coffee". I wished to die at that moment and reborn as that TOI-journalist, right there. To cut the long story short, finally we reached at Sir's suite and rang the door-bell. Can you make a wildest guess , who opened the door?.... Instead of wishing him "Namaste Sir" , We just stared at him , with wide-star-struck-eyes. He looked amused at our childish response and taking the lead, invited us in his suite. Once we settled in, Deepa introduced me as the winner of 'Jeffrey Archer' Contest and continued how tough it was to select the winner from hundreds of right entries. Sujata won cause we loved her slogan. "Namaste Sir. Basically I am a journalist ... no basically I am computer-programmer ...no actually I am a commerce graduate" - I stammered. "Please make up your mind, lady. What are you really ?" - Sir was being sarcastic ? "Actually sir, I am all of the three put together. I learned Commerce and Computer Management, side-by-side. Plus I worked as a part-time-lab-assistant in the computer institute to pay my fees. After gaining B.Com.Degree + Diploma in Computer management, I worked for the World-bank project IPP-V (10 am to 5 pm ) I have a huge respect for Journalism so I learned Mass Communication ( Journalism ) from 6.30 pm to 8.30 pm, in addition to my full time job ". 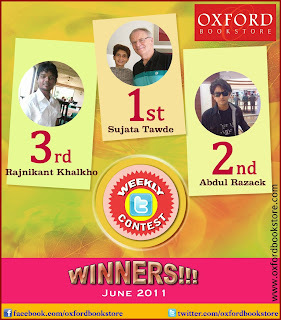 I answered breathless and added, " I stood 1st in Journalism at XIC". By now, Sir's forehead had acquired few more creases and eyes had narrowed to slits. " You are sounding like one of the heroine from my books. Well done. Do all the Indian ladies work so hard or only the journalists ?, I was talking to another journalist who had almost similar story as yours and he faced more hardships as he was from rural India". - Sir. "Thank you very much Sir. Indian ladies do work harder to learn, to realize their dreams and it's much more harder to achieve higher education in rural India." - I continued " Sir, Whatever may be the hardships, we Indians are the luckiest to have the most loving, caring and supportive MOTHERS and sisters who encourage, motivate, inspire us to aim high , to ascend to the dream-summit. Sir, may I ask who was your biggest motivator, guide to transform you into such an Adroit author, a living legend?". With eyes twinkling like stars and a dazzling dimpled-smile ( did you notice Mother-Daughter in the same sentence ) Sir softly answered " My Mother, so you may say we British too have Mothers, which are soul-sisters of Indian Mothers. And my latest motivator is an Indian, the #madeofgreat Sachin Tendulkar. Period." And here, at this surprising revelation, I would like to take a break, Cause I can write the whole novel about what happened in those awesome two hours, when we were with #madeofgreat Sir Jeffrey Archer. I got an autographed copy of his latest novel " ONLY TIME WILL TELL " at TRIDENT , MUMBAI. I will cherish that REVITALising MOMENT .... FOREVER. Whatever Sir talked about his life, his mother, his teachers, his work-habits, his disciplinary-schedule, his hobbies etc. made a lasting impression on me. I vowed to follow in his footsteps then and there. The above picture represents another prize I won after reciting my story of meeting Sir Jeffrey Archer in person. My dear reader, With all my heart, I wish you all the best for getting the opportunity to meet you Idols , your Heroes , Heroines ... soon. Courtsey IndiBlogger Website : The #madeofgreat campaign is the 1st time Tata Motors is undertaking an overall brand association campaign with a brand ambassador. It rides on a strong consumer motivation of 'Seeking Excellence' and 'selfBelief' which is showcased by the confluence of two global brands- Tata Motors and Lionel Messi. The Campaign builds upon Tata Motors' DNA of trust, authenticity, reliability , simplicity as well as it's commitment to innovation. Lionel Messi is talent galore with conviction and is an icon for today's youth. He is a winner who is trustworthy, reliable , pioneering , simple and driven by self-belief, which is what is at the core of Tata Motors as well. Thus proving to be an ideal fit for the role of Global Brand Ambassador.
" What do you think of Tata Motors' association with Lionel Messi ?" Jeffrey Archer, wow! What a writer. I remember those days I spent reading them in succession without taken ng a break. I almost read all of the novels. Was excited to read the narration as much as you were. Maybe we can call this association of Messi and Tata motors as amalgamation of two greats in their respective fields, icons of the respective countries to give that much needed boost of expertise to us and the world. Hi Katie. Thanks and Nice to share our favorite author / books. Hi Poonam, Thanks and Welcome to " Spirit Of Mumbai"
Ah, Jeffrey Archer ! Good post and one can sense the delight you got out of the meeting you had with Sir Archer. Tata Motors and Lionel Messi match each other as they both combine the virtues of excellence and finesse, and in the process, set new benchmarks in their respective fields. Thanks Ashwini Kumar and Welcome to " Spirit Of Mumbai "
First of all thanks "Jeffrey Archer" I spent reading them in succession without taken ng a break. second thanks Sujata share this Post!! Thanks Hazel and welcome to " Spirit of Mumbai ". I am going scarlet with envy Sujata...what a treat to meet the one and only Jeffrey Archer...with the add on a coveted prize! Messi a true 'messiah' for Tata motors and Tata, a colossal brand to power Messi up! Both in perfect harmony! Hi Specs Buffy , Welcome to 'Spirit Of Mumbai' . Indeed it was an unique once in a gazillion years opportunity to meet n interact with Sir Jeffrey Archer. Thanks. Oh wow! I won't hesitate to say I envy you! So glad you met The Jeffery Archer. Thanks Gauri and I know how much you too love book & author so it's alright to envy. Hi Aditi , Welcome to ' Spirit Of Mumbai '. Oh ... WOW ... so you met Sir Jeffrey Archer , was not that d once-in-a-lifetime MOMENT. Thank you so much for appreciation. Oh wow! What an opportunity, for an Eklavya to meet his Dronacharya! I've read a lot of books of Sir Jeffrey too, and so really enjoyed reading your post. And the book you gifted him, my dad was gifted one of those, and its an amazing gift for sure! Thank you so much Leena for understanding the significance of Guru Dronacharya and Eklavya. Glad to know , that we have so much in common about books , authors and Forts of Maharashtra. Not all the man are reaching the peak in life. Lionel Messi did it. Not all the companies are attracted by the customers. Tata motors achieved it. So, how about the collaboration between them? Their match becomes so perfect. How many same characteristics? Perseverance, hard work, simple, gentle and so on. Hence, they both are #madeofgreat. You are so fortunate Sujata! Many congratulations on meet Mr. Archer and for winning the contest! Truly envious for your good fortune :) But extremely glad for you! On what I think of Tata Motors' association with Lionel Messi, well I think that they are very fortunate too, of having the fabulous opportunity of partnering with Messi! Messi is a rockstar ! And his perfection matches perfectly with the strong work ethic and integrity of Tata! Dear Canary , Welcome to ' Spirit Of Mumbai ' . Thanks for your wishes. Hi Mahesh , Thanks and welcome to " Spirit Of Mumbai "
Well, I thought I had read your blog post, but I had missed in the jumble: Sir Jeffery Archer has been my favorite one and I adore his creations which are just penultimate. I just envy you now. Speaking of Lionel Messi I have to reiterate that it is Tata Motors luck to have him on board their cause and a sane ultimate decision which will surely prove to take their brand value to new heights that they dream to achieve. Kudos. Welcome to ' Spirit Of Mumbai '. Thanks a lot for making time to read. Interesting question about Tata Motors - popular brand of Indian auto industry. Tata Motors have provided best vehicles for Indian roads. And about Messi, he is a youth Icon, my son is great fan of him. We will definitely see tremendous growth in popularity of Tata Motors with the association of legend Messi . Thanks Sujata, for sharing this post. Certainly it is indeed motivating :). Thanks Manisha for Inspiring compliment. ThanksArun . Welcome to "Spirit Of Mumbai ". Tata Motors represent India. Tata is associated with reliability, performance and strength of automobiles. Similarly Lionel Messi represents football. He stands for reliabilty, performance and strength of his football team. Welcome to "Spirit Of Mumbai" , Dr. Manoj. Thanks. Nice post , Its great that your dream came true. Thanks Bhawna , Welcome to " Spirit Of Mumbai "
Thanks Alok . Welcome to "Spirit of Mumbai". Thanks Mahima , Welcome to " Spirit Of Mumbai "
Thanks Hema , welcome to "Spirit Of Mumbai"
Thanks Yagnesh , Welcome to " Spirit Of Mumbai "
Wow am sooo jealous... Congrats dear this is HUGE ! Good Morning Ananya. Thanks a lot for your warm wishes. I am glad we both have same honor for the legendary author Sir Jeffrey Archer.